Need a new toy for your child? Knowing how quickly and easily children tire of their toys, a talking pen sounds like a good idea to pique your child’s interest and help him/her learn to read at the same time. The Tag Reading System from LeapPad synchs up with your computer and can store up to six books. Your child needs to put on headphones or follow along in the book as he/she listens to stories such as Chicka Chicka, The Little Engine That Could, Boom Boom and other children’s favourites. The system automatically keeps track of a child’s pace and recommends new books according to the child’s progress. The sound effects which come with the story telling will definitely keep your child awed and full of wonder. 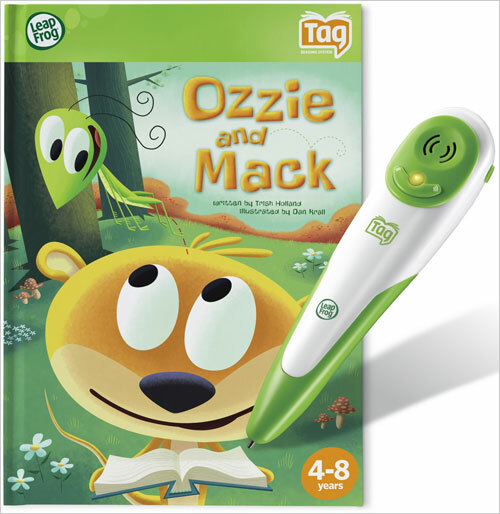 The Tag is compatible with Macintosh or Windows and makes a wonderful educational tool or toy for your curious little one. The ‘talking pen’ is designed for easy grip and hold. The bright attractive colours will encourage children to read. One of the most important skills parents can impart to their children is the reading habit and The Tag is just the right tool for this purpose.